If you’ve never heard of Sir Ken Robinson, you obviously haven’t followed the TED series of inspirational talks. A renowned thinker in the the “development of human potential”, Robinson spoke about the need to reinvent education to better develop the diverse talents, aptitudes and passions of individuals all over the world. 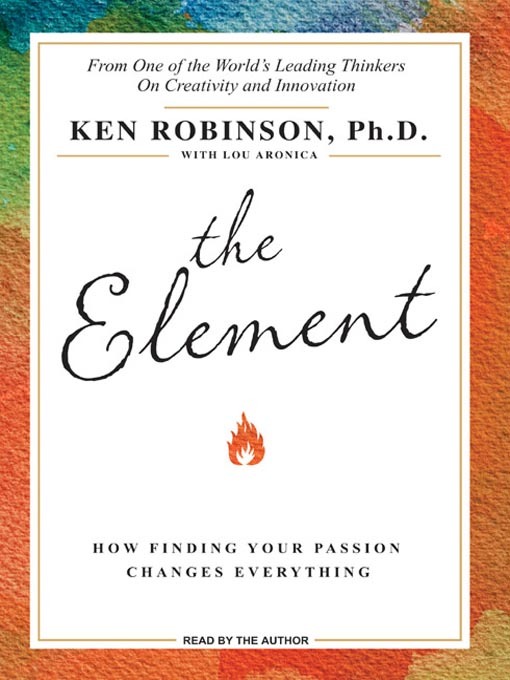 In The Element, Robinson proposed that what we regard as being in our “element” is the “point at which natural talent meets personal passion”. Thus, finding your element allows you to tap on that proverbial “sweet spot” in everything that you do. Doing so empowers you to maximise the vast powers of imagination, intelligence, feeling, intuition, spirituality, physical and sensory awareness inherent in each one of us. According to Robinson, the presence of such a wide diversity of intelligences and talents in each and everyone of us makes a uniform approach in teaching, nurturing and managing people untenable. Poo poo-ing traditional notions of intelligence measured through standardised means like IQ tests and MCQ styled school exams, Robinson cleverly suggested that the question shouldn’t be “how intelligent you are” but “how are you intelligent”. With much flair and panache, Robinson cited how many top achievers in diverse fields like acting, singing, dancing, visual art, directing and writing were poor students. Many of them only shone when they escaped from the stiflingly rigid constraints of the education system, traditional vocations, or their own family’s homes. There are multiple fields of intelligences too diverse to comprehend. As such, placing people into boxes at any age is not a good idea. Creativity is the conduit for one’s imagination. Creativity involved making things that tap into the various talents at one’s disposal. It also evokes the need to open one’s mind beyond the logical, linear and analytical. Creativity also uses both our brains and our bodies while reaching deeply into our intuitive and unconscious minds and feelings. Creative practitioners in any field – medicine, music, mathematics, art, or sports – can easily resonate with the feeling of being “in the zone”. Defined by renowned psychologist Mihaly Csikszentmihalyi as “flow”, it is the state of euphoric absorption and intense concentration where one is so focused and absorbed on the task at hand that the rest of the world just fades away. When this happens, time slows down. Finding the right people to connect with – one’s tribe so to speak – is a vital aspect of building upon one’s element. Being in the right tribe can be transformative while providing three powerful components of tribal dynamics: validation, inspiration, and the “alchemy of synergy”. The latter describes the unique chemistry created by teams coming together. Along the way, you may experience personal, social and cultural barriers to achieving your true potential. When this happens, you may have to take the drastic step of “swimming against the tide” or uproot yourself to find a different place to operate from. Luck really has nothing to do with it. Rather, our attitudes, beliefs and perseverance helps us to shape our respective destinities while making the best out of seemingly adverse situations. Having good mentors and coaches in your journey is an important ingredient of finding your element. They can be for short, medium or long periods of time, or even span decades. It is never too late to start, subject to your physical and mental limitations of course. Benjamin Frankling invented the bifocal lens at 78, Agatha Christie wrote The Mousetrap at 62, while Jessica Tandy won the Oscar for Best Actress at age 80. You can either be a professional or an amateur indulging in your passion while holding down a full time job. This is the idea behind recreation – an active and engaged process which uses one’s energies and engages one fully while recharging his or her being. Education – not in the traditional form – is a key component of this. I love the example which Robinson cited of the town of Grangeton. It isn’t technically a “town” per se but an environment run by elementary school students at Grange Primary in England. Like a typical town, Grangeton has a mayor, town council, newspaper, television studio, food market and museum. What’s amazing was that the entire “town” was run by children with the guidance of their teachers. Such approaches in experiential and relevant learning may actually evoke better social and academic outcomes. Perhaps the best part of the book is its use of numerous real life examples. Drawn from the lives of esteemed individuals like Matt Groening (creator of Simpsons), Paul McCartney, Richard Branson, Ewa Laurance and others, their life journeys revealed that there are many routes to self actualisation. Many of these do not involve being a doctor, lawyer or banker. Of course, Robinson also cited academically brilliant folks. An example was maths whiz Terence Tao. Without the external pressures of societal demands imposed upon him, he managed to find his path in life. If you’re looking for something inspirational, thought provoking and motivating, The Element is definitely for you. I’ve listened to Sir Ken Robinson’s video several times and indeed it’s a very inspiring speech. It changes the way I view education & creativity – it is more than just tests/assessments to churn out good grades/students. The Element is a good book in my to-read list. Will check out this book. I loved his TED talks and I would like to get The Element. Would you happen to know where I could get this in Singapore? Thanks for the amazing review!